The Three Pigs | What is ML Reading? 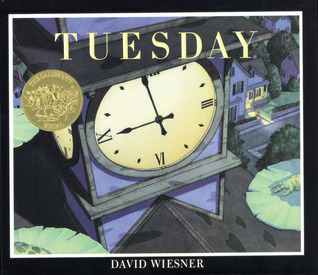 The first David Wiesner book I read was Tuesday. Dr. Amber Prince introduced me to his work in one of her Teaching Reading classes. The Three Pigs was ML’s first introduction. 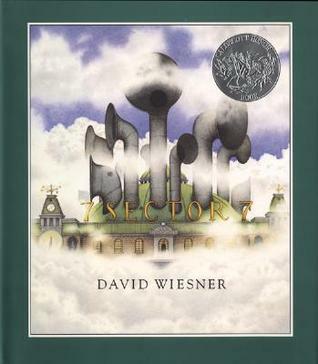 Last week, I brought home all the David Wiesner books I could find on the shelf. ML was particularly fond of Tuesday and Sector 7. I purchased his most recent book, Mr. Wuffles, for ML’s birthday. She opened the book and said, “Mommy, you know I don’t like comic books.” We didn’t have time to read it that evening, but as she closed the books she saw the photo on the book jacket of legs and a cat. It peaked her interest. So Monday night, we “read” Mr. Wuffles. I say “read” because aliens do most of the speaking. The text looks similar to Wingdings in Microsoft Word. We enjoyed making up our own pronunciation. ML was wrong. She might not like comic books, but she loves David Wiesner’s books. Even the ones that look similar to comic books. Her favorite is Sector 7. A book about a child whisked away by a cloud from the Empire State Building Observation Deck during a field trip. The cloud takes the child to Sector 7 where clouds are shaped and sent throughout the world. The child modifies the blueprints resulting in artistic clouds; mostly fish and sea creatures. We thought about other ideas for clouds. ML drew pictures of her ideas and gave them to David Wiesner. . . a pumpkin, a peace sign, a cherry, an apple with a worm, a flamingo, a peacock, a flower, a heart and a sun. He enjoyed all of them but was especially impressed with the detailed peacock. P.S. David Wiesner showed a painting from when he was 5 to illustrate he wasn’t a child prodigy. Many children and most adults stop doing art. He encouraged us to try it again. Tonight, before I go to bed I’ll sketch something. ML draws something everyday. I want to encourage that for years.